BY ERNST VANBERGEIJK, Ph.D., M.S.W Most non-disabled adults take for granted the ability to travel overseas for business or pleasure. However, for many teens and young adults with disabilities, the ability to travel independently without their parents is a dream. At best, they may have gone on a holiday with their families. They have never traveled to a foreign country with their friends. The benefits of traveling internationally for students with disabilities are numerous. Not only does it improve their quality of life, but it also reinforces a plethora of skills that classroom learning could not possibly touch. International travel boosts the individual’s confidence and gives them a sense of independence. For students with executive functioning deficits it is an opportunity to practice time management, organizing one’s belongings, daily hygiene, and medication management. Students who have social skills deficits practice conversational skills while on the tour bus with friends and at meals by discussing the new foods and sights they are experiencing. Making sure they know the basic pleasantries in the destination country’s language, such as “hello,” “please,” “thank you and no thank you” reinforces social skills to be used at home. International travel also reinforces basic travel training skills that can be used in the employment of people with disabilities. Pre-existing travel groups that cater to people with disabilities may be difficult to find, but that should not stop you from organizing a trip on your own. What steps should be taken to insure a safe and enjoyable experience for the students? Vocational Independence Program worked with Casterbridge Tours™ to organize our trips. 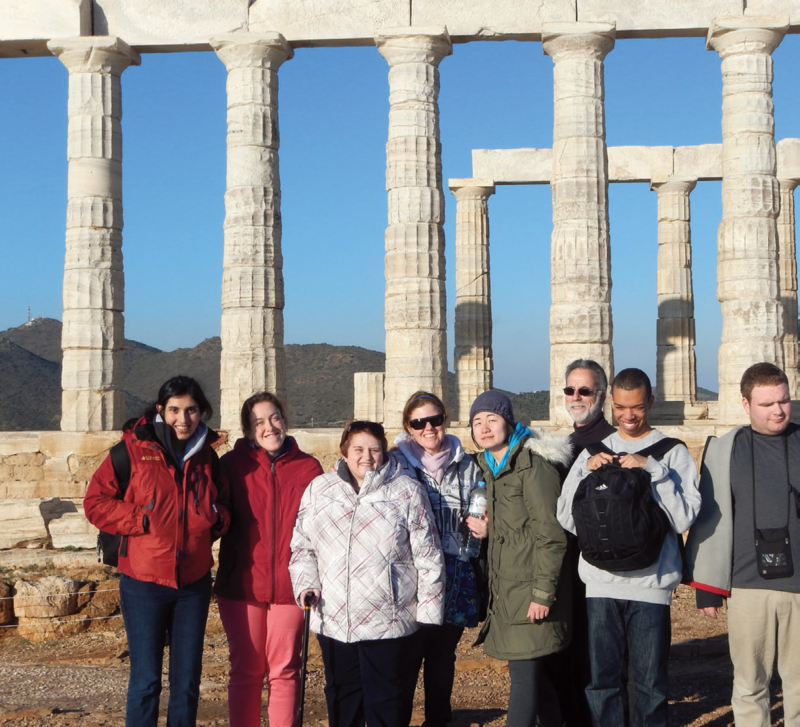 The company was recently acquired by World Strides™ and booked our trip to Greece this past January. When possible, this company even had the same tour guide travel with us on repeated trips to various countries in Europe. The benefit of this was two-fold. First, the tour guide knew how to work with people with disabilities and knew each of our students and alumni personally. Second, our students’ familiarity and comfort with him made it as though we had an additional chaperone or staff member on the trip. They viewed him as an additional authority figure on the trip and followed his instructions. The third step is to discuss with the tour company the accessibility of the potential destination, not only in terms of physical accessibility, but also the country’s acceptance of people with developmental disabilities, autism, cerebral palsy, TBI etc. such as the pyramids in Coba, Mexico or the Acropolis in Athens, Greece might be taxing for some tour members. Even escalators can be challenging with some individuals unable to judge the speed of steps, which can paralyze the person in fear and hold up the group. Identify individuals that need extra support ahead of time. Develop procedures on what to do if someone falls behind and assign specific chaperones to assist these individuals. Talk to the travel professional about the country’s culture and how they view disability. We have experienced discrimination in some countries when our students have tried to purchase lunch in a restaurant. The owners refused us service and we had to go elsewhere. many of whom were on the autism spectrum, but that was after they welcomed their first class passengers, their business class passengers, and their platinum, gold, and silver club members. To further accentuate the gate and flight crews’ lack of understanding of the need of people with disabilities to preboard, four passengers in wheelchairs had to try to board in the midst of this throng of people. Likewise, it is important to impress upon the tour operator to limit lay overs and transfers. This is stressful for most travelers, but can be exceptionally stressful when guiding a group of individuals with disabilities who may have co-morbid anxiety. If a layover is absolutely necessary, then discuss which airport might be best for your group. Some airports have better reputations than others in terms of ease of transfer, number of times one has to go through security, and overall congestion. Make sure the tour operator understands how stressful it will be for your group and that they will need sufficient time to conduct the transfer. We were sprinting through Heathrow Airport in an attempt to catch our connecting flights. Winded and stressed, the flight crew closed the plane door as our last group member walked aboard. Establishing the price of the trip will not only be dependent upon the length of the trip, location, time of year, but the size of your group. Negotiate the number of free chaperones you will be entitled to, based upon the number of paying students ahead of time. That ratio will depend upon the level of disability. For a group of students that are verbal, high functioning, with only relatively minor mobility impairment, a ratio of one chaperone per six to eight students in manageable. and flexible enough to experience delays while traveling and willing to try new foods, cultures, and experiences. Students on group trips also need to be able to manage their own medications, passports, luggage, and electronics usage. The ability to follow directions of the chaperones and tour guide is an essential quality of a good tour group member. They also must have the ability to share a room with others as tour prices usually are based upon double or even triple occupancy. known before departure and pay the cost differential. To reduce anxiety and to ensure a smooth trip, hosting an orientation meeting one month prior to departure helps immensely. This is an excellent opportunity to review the necessary travel documents, the itinerary, room assignments, sightseeing highlights, and tipping practices. It is also an opportunity to conduct mini-workshops. One of the mini-workshops or lectures should be on handling of passports and behavior during customs and immigration screening. We recommend students carry a passport wallet that can be worn under the clothing and against the body to deter theft. Waiting until called to approach the passport control booth is an essential skill, and looking the immigration officer in the eye will lessen the likelihood that a person with a disability, such as autism, will be pulled out of line for further questioning because they did not follow the social norm of waiting behind the line and looking the person in the eye. A second mini-workshop should involve the description of the security screening process at the airports. Here, the emphasis should be on general suggestions or guidelines with a reminder that specific details (e.g., whether or not taking off one’s shoes is required) varies from airport to airport. Even the number of times one travels through security screening checkpoints varies. The key take home point is that when passing through security, one should act in a serious and respectful manner. It is not a time to joke around. Providing the travelers with a guided imagery exercise with each step of the way covered (e.g. removing of various items of clothing, and jewelry, placing items in the bin, toiletries in clear plastic quart sized bags in the bins, removing of laptops and tablets, holding on to one’s boarding pass and passport, and finally walking through the scanners) can greatly reduce pre-departure anxiety. A third mini-workshop to cover is how and what to pack. The biggest mistake many first time travelers make is packing so much clothing that they are unable to manage their own luggage. Clothing can be worn more than once. It also can be washed while on the road. Many companies offer special travel clothing that can be washed by hand in a sink and dry overnight in the hotel room. Ex-Officio™ manufactures both men’s and women’s clothing that is quick-drying, often insect repellant, and provides excellent SPF protection from the sun’s ultraviolet rays. When traveling to destinations with the potential for colder weather, the traveler should think about layering. A based layer of moisture wicking material made of silk, wool, and synthetics blends is ideal. Avoid cotton made clothing in both hot and cold environments because they dry very slowly and do not insulate well at all. Comfortable shoes are essential. Worn-in hiking boots will help the traveler with navigating cobblestone streets, rocky trails, and archeological sites that are uneven and ankle twisting. Tennis shoes and sandals are appropriate for many warmer destinations. High heels are rarely practical on these kinds of trips. will provide an extra sense of security and confidence. The carryon should also contain your entertainment needs for the flight, as well as all the necessary plugs, adapters, converters, and back-up batteries. introduce a food challenge. We strongly recommend that they eat at local restaurants. As a result the student travelers have eaten escargot, octopus, Dutch licorice, poi, plantains, and even bangers and mash. However, if they try new local foods, then the chaperones break down and buy the travelers Starbucks or McDonalds in the destination country, much to our chagrin. Give yourself and the group plenty of time at the airport prior to departure. The general guidelines are that you need to arrive two hours ahead of flight time for a domestic departure and three hours ahead of time for an international flight. These general recommendations are fine for individuals who do not have any disabilities, but when you are escorting a group of individuals with both cognitive and motor disabilities, the more time you arrive in advance, the better. On one of our trips, the traveler arrived to the airport without her luggage. She had plenty of time to run home to retrieve it. Going through security with a large group will take longer than you can anticipate, especially if one of your party opts out of the full body scanner and requests a private pat down. The time spent at the gate will allow the travelers to get to know each other, purchase snacks, and manage their belongings. It will give the chaperones time to talk to the gate agents and flight crew. Request preboarding. Explain the nature of your students’ disabilities. Double-check that they are not sitting at an emergency exit. If the students are unable to handle the task, request that their seats be changed. Spend the time reviewing both your electronic and hard copy documentation. We bring copies of each traveler’s passports, medical alerts, the room assignments, the daily trip itinerary, emergency contact telephone numbers and e-mails, and the tour company’s contact information. When boarding we hand the flight crew the list of travelers who are accompanying us, give them a brief overview of the nature of their disabilities and instruct them to contact one of the chaperones in the event of an issue. Ernst VanBergeijk, Ph.D., M.S.W, is the Associate Dean and Executive Director at New York Institute of Technology Vocational Independence Program (VIP). The Vocational Independence Program is a U.S. Department of Education-approved Comprehensive Transition and Postsecondary (CTP) program. nyit.edu/vip . Dr. VanBergeijk also administers Introduction to Independence (I to I), a seven-week summer college preview program for students ages 16 and up. Dr. VanBergeijk accompanies all of the international training trips with his students and alumni.